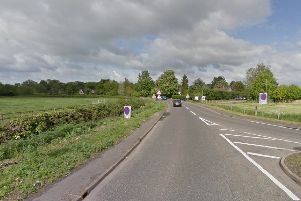 A man has been charged and will appear i court today charged with causing the death of a young motorcyclist in a hit and run in Cambridgeshire earlier this week. Ricardas Taraska, 23, of Pinder Road, Norwich, has been charged with causing death by dangerous driving and failing to stop and report a road collision following the crash at Linton in the early hours of Wednesday morning, August 29. He is due to appear at Cambridge Magistrates' Court this morning, Friday August 31. Officers investigating the fatal collision on the A1307 near Linton are appealing to motorists who may have been in the area prior to the incident. In particular they are keen to trace the driver of a Mercedes Sprinter van that was registered from 2016 onwards. The crash involving a motorcycle was reported to police at 3.32am on Wednesday August 29. Ambulance crews attended but the motorcyclist, a man in his 20s, was pronounced dead at the scene. It is believed that another vehicle may have been involved but left the scene. Enquiries are still ongoing and anyone with any information is asked to call 101 quoting incident 40 of the 29 August.